It’s that time of the year again! 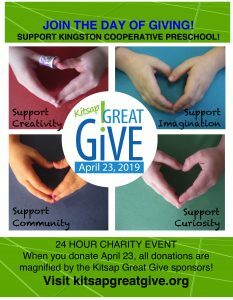 The Kitsap Great Give – 24 hours of online giving hosted by Kitsap Community Foundation. Every dollar you donate is boosted by the Bonus Pool! You can give to some of your favorite local causes, including Kingston Cooperative Preschool! It’s easy and fast too! Just visit the link below and choose KCP as the recipient of your gift. Thank you and happy giving! Attention all Middle School and High Schoolers! This event is just for you! Bring a basket and get ready to run to collect as many eggs as you can find! Tons of great prizes! Will you be one of the lucky winners of our Golden Egg Prizes? 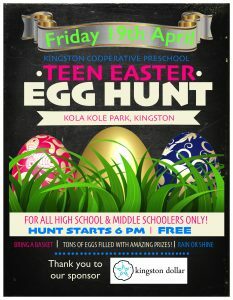 Get there early, as the Egg Hunt starts at 6pm sharp. This event is now FREE thanks to Kingston Dollar and West Sound Appraisal for their amazing sponsorship. KINGSTON DOLLAR is a brand new dollar plus store located in the Albertson’s shopping complex in Kingston. Why should the kids have all the fun! 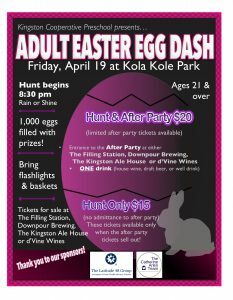 Come to the Adult Easter Egg Dash at Kola Kole Park in Kingston! More than 1,000 eggs will be hidden all over the field! We will have several $100 Golden Eggs and many other amazing prizes! Come with a flashlight and basket and get ready to run! We are offering tickets that will get you admission to the after party at participating businesses and includes a drink (these tickets cost $20) or to just do the egg hunt for $15. Hunt only tickets will go on sale after the party tickets sell out. Tickets for the After Party and Hunt are on sale now at Downpour Brewing, d’Vine Wines, The Kingston Ale House and Filling Station. Where you purchase your ticket is where you will attend the after party. Hunt Only tickets will go on sale once the After Party tickets sell out. 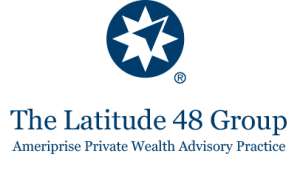 Thank you to our amazing sponsors The Catherine Arlen Team Windemere RE West Sound, Inc. and The Latitude 48 Group at Ameriprise. Year after year they have supported our school and this community in so many ways. Thank you!